Leonard Haynes has seen a lot in his decades-long career as an educator and public servant. But Monday will go down as unprecedented for the former executive director for the White House Initiative on Historically Black Colleges and Universities (HBCUs). When Haynes walked into the Oval Office to meet with President Donald Trump, Secretary of Education Betsy DeVos and other administration officials – not to mention presidents from nearly 100 HBCUs – Haynes allowed himself a moment. “Oh, man … yesterday was great and historic. I’ve been around a long time and I’ve never seen so many black folks gathered in the Oval Office,” said Haynes, who was part of that photo opportunity. He also helped bring together the Trump administration and congressional leaders to discuss areas of collaboration between HBCUs and the federal government. On Tuesday afternoon, Trump signed an executive order moving the federal initiative HBCUs into the White House from the Department of Education, where it was housed under President Barack Obama’s administration. It establishes a President’s Board of Advisors on HBCUs, though much of the administration and budgeting will remain in the Department of Education. It was officially titled Presidential Executive Order on The White House Initiative to Promote Excellence and Innovation at Historically Black Colleges and Universities. Johnny C. Taylor, president and CEO of the Thurgood Marshall College Fund, who worked with White House officials drafting the order, shares Haynes’ jubilation – but admitted to mixed feelings. 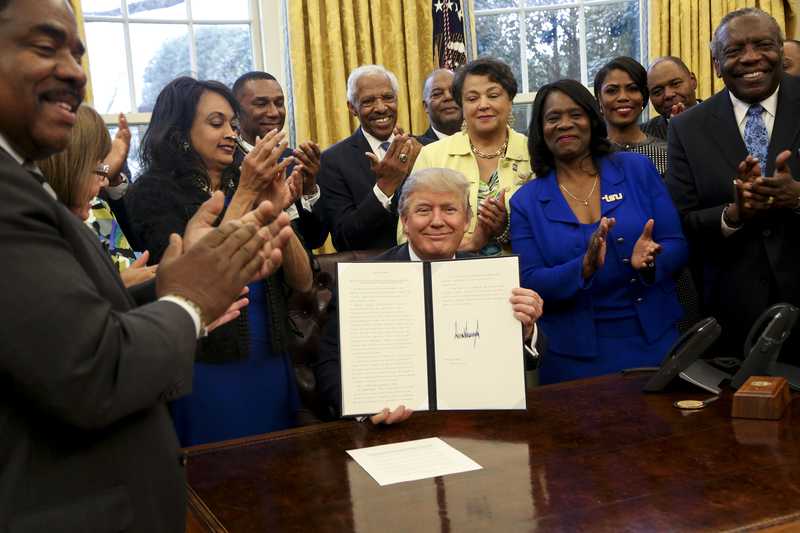 U.S. President Donald Trump signed the HBCU Executive Order to support Black Colleges and Universities in the Oval Office of the White House,on February 28, 2017 in Washington, DC. The executive order moves an initiative to assist the Historically Black Colleges and Universities from the Education Department back to the White House. U.S. Rep. Sheila Jackson Lee (D-Texas), a member of the House Budget Committee, was more skeptical. “There is no substance at this point,” she said Monday, adding that she was waiting to see the contents of Trump’s executive order, and what Congress does during the budget process. The order establishes an executive director of the White House Initiative on HBCUs, which will be in the Executive Office of the President. Part of that person’s responsibilities will be to strengthen schools through enhanced planning and development, collaboration with the private sector, participation in federal programs and upgrading infrastructure. “A new HBCU Executive Order issued in the first 100 days of the Trump-Pence administration is a step in the right direction to promote the critical mission of HBCUs, which have created the nation’s foremost African American leaders for 150 years and counting. The president has set a high bar; however, we await the opportunity to see if the administration will meet their pledges, specifically as it pertains to funding for HBCUs,” said Michael L. Lomax, UNCF president and CEO, who was among those present at the ceremonial signing of the order. According to the Associated Press, HBCU presidents are hoping Congress will dramatically increase funding in the upcoming budget. They are calling for $25 billion for infrastructure, college readiness, financial aid and other priorities. Under Obama’s administration, historically black colleges and universities received $4 billion over seven years. “The next step is the budget. You cannot have mission without money,” Taylor told reporters outside the White House after the signing ceremony. Republicans in Congress said there are no concrete plans for increased funding at this point. Several of them who attended meetings Tuesday, including South Carolina Sen. Tim Scott and North Carolina Rep. Mark Walker, helped arrange the meetings with HBCU presidents, GOP officials and business leaders. In the months leading up to Tuesday, HBCU presidents had made their pleas to the Trump administration clear — wanting 5 percent of total federal grants to universities, internship and cooperative agreement funding and 10 percent of all federal contract funding to colleges and universities. Doing so, the HBCU presidents say, would nearly double federal support to the HBCU sector. HBCU presidents also asked to move the White House HBCU Initiative, which dates to 1981, to the White House, in the hopes of getting more access to the president. Some have contended that the president’s showy and vocal support of HBCUs — and its initiatives — are an attempt to one-up or discredit Obama, who was criticized by many in the HBCU community after cuts to the amount of time covered by Pell Grants were instituted and other changes to loan programs left thousands of low-income students at HBCUs unable to pay tuition. Obama’s White House has countered, saying that federal funding for HBCUs was increased by nearly $1 billion during his presidency — something Obama echoed during an Undefeated town hall meeting last October at North Carolina A&T State University – with most of the additional resources coming in the form of increased student financial assistance. Monday’s event was described as a “listening session” by the White House, the meeting at the Eisenhower Executive Office Building came before the president signed on Tuesday. The move will put Trump’s stamp on an order that has been tweaked and signed by every president since Jimmy Carter. President Ronald Reagan created the White House Initiative on HBCUs by executive order in 1981. In 1989, President George H.W. Bush established a Presidential Advisory Board on HBCUs, and in 2002, President George W. Bush transferred the initiative from the White House to the Department of Education. One of Trump’s most visible black aides is Omarosa Manigault, who holds degrees from two HBCUs: Central State University in Ohio and Howard University in Washington, D.C.
Others, however, remain suspicious of the administration’s intentions. Those concerns were underscored by DeVos’ comments Monday praising HBCUs as “pioneers” in school choice which gave African-American students more options to pursue higher education. But the facts are that HBCUs were often the only options to get a college education because segregation blocked generations of black students from enrolling at white colleges and universities. Those barriers did not begin to fall until laws were put in place to end institutional segregation in the 1960s.